Though the latest news item here dates back to November, 2008, this does not mean that nothing happened with For Inspiration Only in the meantime. Instead of an apology, a recap of what happened in 2009 (and the last months of 2008). Bamboo Space: On September 16, 2008, Wacom launched a free online service for collecting, organizing and annotating your ideas, called Bamboo Space. Bamboo Space is the result of an early design exploration to make meetings more productive by For Inspiration Only and fieldOfView. Over time this concept transformed into an online visual collaboration tool for people who buy the wonderful new Bamboo tablets. For Inspiration Only has been both the inspiration and the continuous creative direction for Bamboo Space, with a vast range of interesting collaborators. The driving force for the project was Wacom’s very own Peter Kurstjens who continuously kept the team motivated and the project going. Bamboo Space is bound to make it into my Sources of Inspiration. Please head over to http://bamboospace.eu and try it out for free. Bamboo Minis: On September 16, 2008, alongside with Bamboo Space, Wacom also launched an implementation of another idea by For Inspiration Only called Bamboo Minis. Minis are small applications that live in your Bamboo Dock and allow you to expressively interact with your computer using your pen tablet. For example, you can quickly draw your route on Google Maps using Landmarker, send a visual status update using Drawtweet, and play one of several games for the fun of it. The Bamboo Dock is an open platform, allowing any developer to create, submit and publish Minis. The original idea for Bamboo Dock and Minis was developed in April 2008 (before there was such a thing as an iPhone App store) by For Inspiration Only and Perceptor in the Bamboo Live Vision. Our Penamajams vision has turned into this huge Mini platform. Most of all, the effect and feedback of all this has been enormous and in the future there may be more. This happened – Utrecht #2, #3 and #4: The first This happened – Utrecht in November 2008 was an overwhelming success with great speakers and interesting questions from the audience. It has been followed up by three more lovely events. All different and all interesting in their own way, it is always surprising to see that the mix of speakers, audience, organizers, location and even the weather can influence the dynamics of such an event. We have had tremendous feedback and coverage, but the thing we really look forward to after each event is Iskandr searching for a theme in his reports (in Dutch) or the photos by Yohan. We are blessed by a continuously growing interest in each event, resulting in ever shorter timeframes in which we sell out our free reservations, starting at an hour and now in less than one minute. Our next This happened – Utrecht will take place on February 22, 2010. With a larger venue, we now hope to give our participants sufficient time to register their tickets. Teaching at the Willem de Kooning Academy: Starting February 18, 2009, Ianus Keller started teaching the Crosslab classes at the Willem de Kooning Academy in Rotterdam. Crosslab aims to look at the impact of technological innovation and digital/social media on the different disciplines taught at the academy. In one year the 70 students went from being skeptical towards technology- and sometimes even afraid of technology -, to being able to handle concepts like blogging, Augmented Reality, twittering, RFID tags and video collages. In the first semester the students looked at the impact of technology and new media in retail environments. In the second semester they focused on the impact of blogging, digital media and display technologies on publishing (specifically glossy magazines). The results of the first semester were exhibited in Galerie in de weg as new ideas for the Voorstraat Noord and the Gemeente Dordrecht. In the second semester the students went even further in making impressive movies and experimenting with Augmented Reality. Information & Electronics: Parallel to the teaching at the Willem de Kooning Academy, Ianus Keller also started coaching students at the TU Delft, Faculty of Industrial Design Engineering. In the Interaction and Electronics course five teams of about four students are designing for interaction. In this case theway an electronic shopping assistant would help a consumer experience a store. Given the tight variables, the outcomes were pleasantly varied and creative. Intel Design Expo 2009: In a long tradition of design competitions, For Inspiration Only was involved in the latest endeavour by usability guru Joy Mountford to get students from design schools to work with problems from big tech companies in this year’s Intel Design Expo. With the TU Delft ID-StudioLab Ianus Keller organized the selection and further coaching of the two teams of students that presented their work at the Intel Developer Forum in downtown San Francisco in September, 2009. The first design concept, Keyping, uses a magnetic board and location-aware keyrings to help elderly people stay in touch with their beloved ones. The second concept, Tate, uses wearable electronics and mutating avatars to support kids with their social networks both online and offline during the transition from elementary to high school. The Intel Design Expo itself was a very nice event and Dutch. The day after the event the teams were invited at several interesting places. On speaking terms: Starting in February 2009, For Inspiration Only worked on setting up a collaboration between de Hogeschool Utrecht and TU Delft on how to bring the new tools for user involvement, which have worked very well for larger corporations, to collaborations between different small and medium enterprises for product-service combinations. In December 2009, a final version was submitted to RAAK PRO, we are eagerly awaiting the results of that. Multitouch NL: On December 14, 2009, Ianus Keller was asked to speak at the first MTNL – Multitouch Nederland, a meeting of people working on or involved in projects related to MultiTouch interfaces and technologies. During this event in the Pakhuis de Zwijger in Amsterdam, Ianus talked about developing expressive interfaces for the Bamboo Dock platform mentioned above, and of course briefly touched upon his early Cabinet work, which is often categorized as a good example of a multitouch interface. 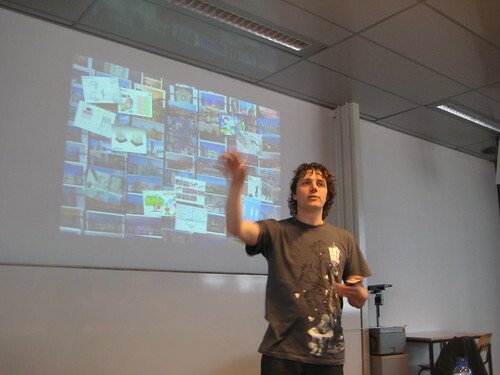 Invited talks: Ianus Keller was invited three times at the The Hague University to speak about trends in interfaces. Part of the For Inspiration Only yearly routine now, is reviewing the concepts for Interactive Technology Design at the TU Delft. To satisfy our sponsors for This happened – Utrecht, we have agreed to speak at the Flux lecture series. We decided to eat our own medicine and use the 10 minute presentation format for our own project, but went gravely overtime. As a first introduction to the students of the Willem de Kooning Academy Ianus Keller gave a talk at the Crosslab lunchevents on multi-touch and table interactions. For Inspiration Only has started full throttle this year. Hopefully this news item paves the way for more news and background to come to this site in 2010.